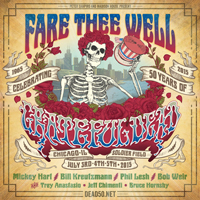 The 4th of July weekend will find Brutus back in Chicago at Soldier Field for the Fare Thee Well performances by the surviving members of the Grateful Dead. Lou was actually at Soldier Field on July 09, 1995 when the Dead made their final appearance with lead guitarist Jerry Garcia who passed away a few weeks after the the concert. Though it surprises some, LB is a grizzled veteran of over 125 Grateful Dead shows including his very first when the band played in his tiny hometown of Englishtown, NJ.